Wisdom teeth only partially erupt. This leaves an opening for bacteria to enter around the tooth and cause an infection. Pain, swelling, jaw stiffness, and general illness can result. Impacted wisdom teeth may continue growing without enough room, damaging adjacent teeth. A fluid-filled sac (cyst) or tumor forms, destroying surrounding structures such as bone or tooth roots. People between the ages of 16 and 19 should have their wisdom teeth evaluated. If they need to be removed, it should be considered before age 20 when generally fewer complications occur. At a younger age, tooth roots are not fully developed, the surrounding bone is softer, and there is less chance of damaging nearby nerves or other structures. There is also less surgical risk and healing is generally faster. 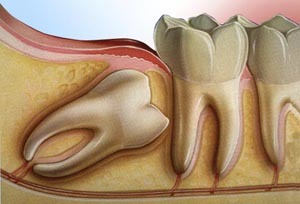 Extractions of wisdom teeth may be performed by a general dentist. If your dentist anticipates any special care will be needed, he or she may refer you to an oral or maxillofacial surgeon. An oral or maxillofacial surgeon is a dentist who specializes in surgery and the removal of wisdom teeth. Before surgery, your dentist will explain what to expect, have you sign a consent form and give you personalized instructions to follow. Keep in mind these general items in order to help your surgery go smoothly. Wear loose, comfortable clothing and arrange to have someone be with you after surgery. Extraction can be performed under local conscious sedation or general anesthesia. Following surgery, you may experience some swelling and mild discomfort, which is part of the normal healing process. Cold compresses can help decrease the swelling and medication prescribed by your dentist can help decrease the pain. You may be instructed to drink only clear liquids following surgery and later progress to soft foods. Some patients experience numbness or tingling following surgery. Normal sensation usually returns in a short period of time. Occasionally, a dry socket occurs when the blood clot breaks down earlier than normal. A dressing placed in the socket protects it until the socket heals. Talk with your dentist about any questions that you have. It is especially important to let your dentist know, before surgery, of any illness that you have and medications that you are taking. If your general dentist has referred you to a specialist, they will both work together to provide you with the best and most efficient care. Keeping your teeth healthy – to a wise old age – is your dentist’s primary concern. A sealant is a clear shaded plastic material that is applied to the chewing surfaces of the back teeth (premolars and molars), where decay occurs most often. This sealant acts as a barrier, protecting the decay prone areas of the tooth from plaque and acid. Each tooth only takes a few minutes to seal. First, the teeth that will be sealed will be cleaned. The chewing surfaces are then etched (roughened) with a weak acidic solution to help the sealant adhere to the teeth. Finally, the sealant is placed onto the tooth enamel and hardened. Some sealants need a special curing light to help them harden, while others do not. Although children receive significant benefits from sealants, adults can also be at risk for pit and fissure decay and thus be candidates for sealants. Your dentist can advise you about the need for sealants. Sealants are also recommended even for those who receive topical applications of fluoride and who live in communities with fluoridated water. Fluoride helps fight decay on the smooth surfaces of the teeth but is least effective in pits and fissures. When the sealant is applied, finger-like strands penetrate the pits and fissures of the tooth enamel. Although the sealant cannot be seen with the naked eye, the protective effect of these strands continues. As a result, it may be several years before another application of sealant is needed. Reapplication of the sealants will continue the protection against decay and may save the time and expense of having a tooth restored. Sealants will be checked during regular dental visits to determine if reapplication is necessary.